I am a total kid when it comes to a lot of things. I get extremely excited about making our traditional gingerbread house and decorating our Christmas tree each year. And going pumpkin ‘hunting’ and the scared ritual of pumpkin carving. And dying Easter eggs is no exception either! I followed the directions and went to town! I thought these turned out so neat and I was so happy it worked (I’ll admit I was a little skeptical about the whole process)! 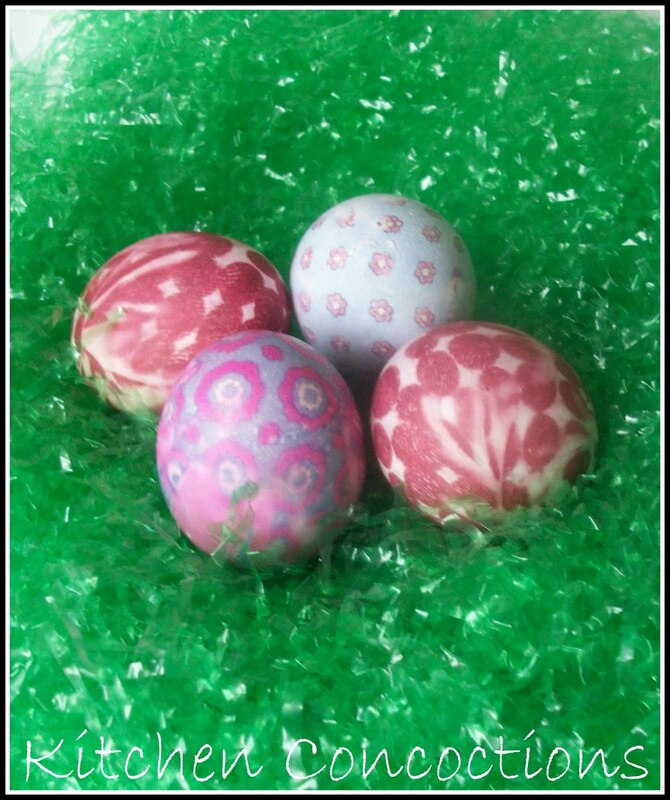 So if you are looking for a new and impressive way to dye eggs this Easter make “Tie” Dyed Eggs. Kids young and old alike will have fun and be wowed! First remove seaming from ties and any lining on the inside. You want just the silk. Cut silk into a large piece to wrap around a raw egg. Next wrap an egg with a piece of silk, making sure the printed side of the material is facing the egg. Try to make the fabric as smooth as possible. 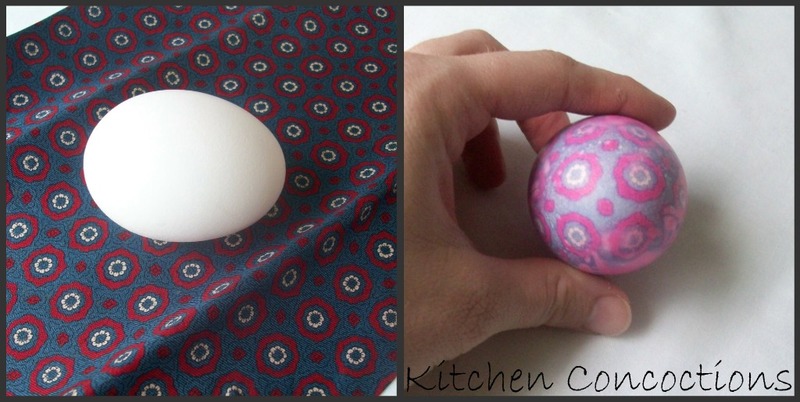 The pattern will transfer better if it is right up against the egg. Any part that is folded or wrinkled will leave a tie-dyed pattern. Secure silk fabric with twist-tie. Place the silk-wrapped egg in a piece of white sheet and secure tightly with another twist-tie. Repeat with additional silk ties and eggs. Place the eggs in a pot. Fill pot with water to cover eggs completely. Then, add 1/4 cup of white vinegar. Bring water to a boil and simmer for 20-25 minutes. Remove eggs from water with tongs or spoon and let cool on a pile of paper towels or in a colander. 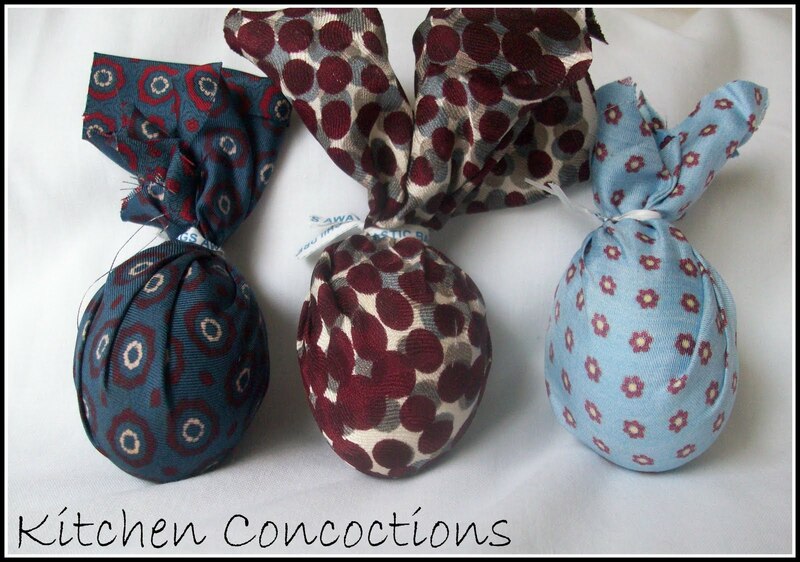 When eggs are cool enough to handle remove the fabric and enjoy your beautiful eggs! Or check out these bright colors! Look I can even be a hand model! Oh this was so much fun!!! 1. 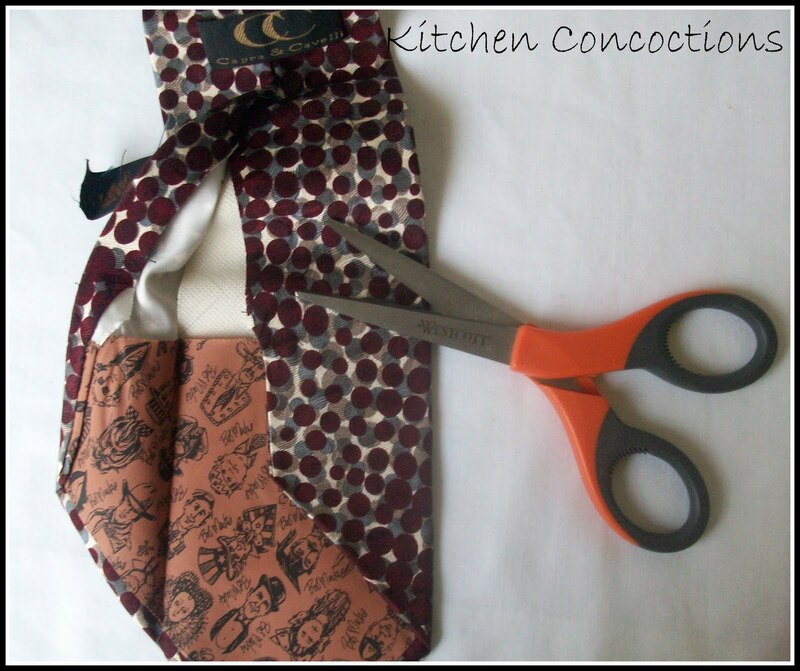 Remove seaming from ties and any lining on the inside. You want just the silk. 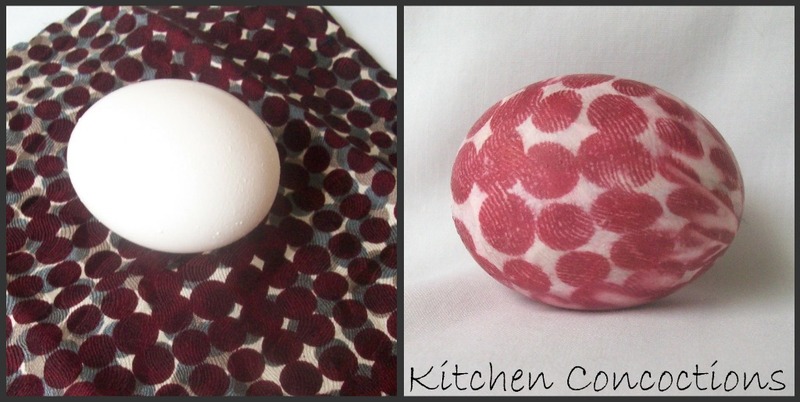 Cut silk into a large piece to wrap around a raw egg. 2. 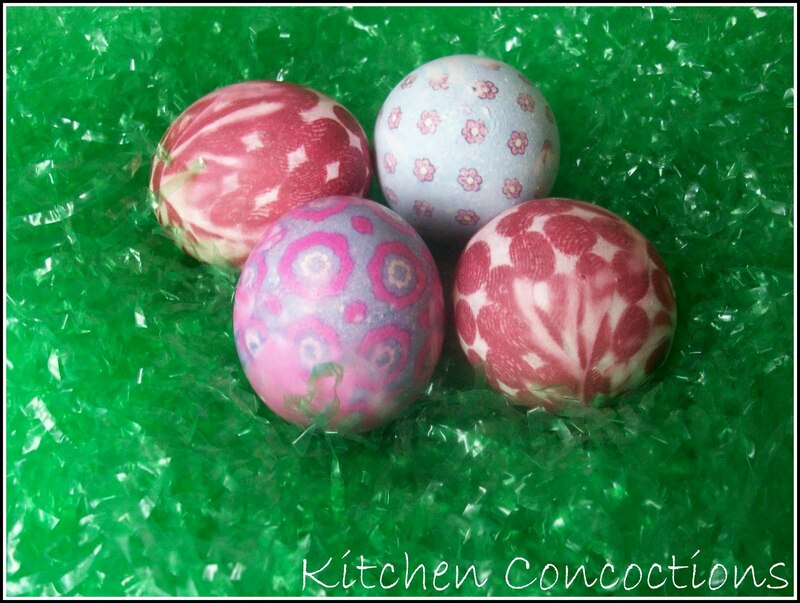 Wrap an egg with a piece of silk, making sure the printed side of the material is facing the egg. Try to make the fabric as smooth as possible. 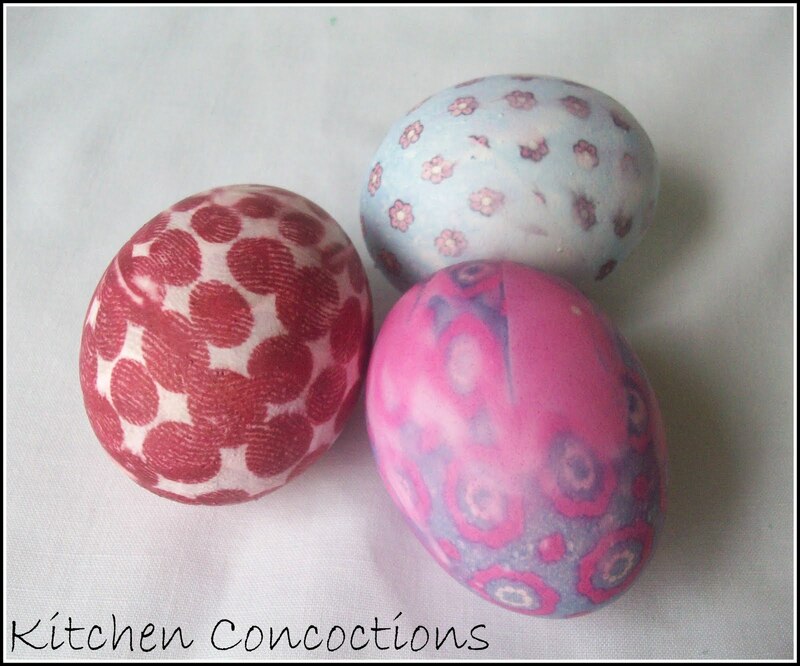 The pattern will transfer better if it is right up against the egg. Any part that is folded or wrinkled will leave a tie-dyed pattern. 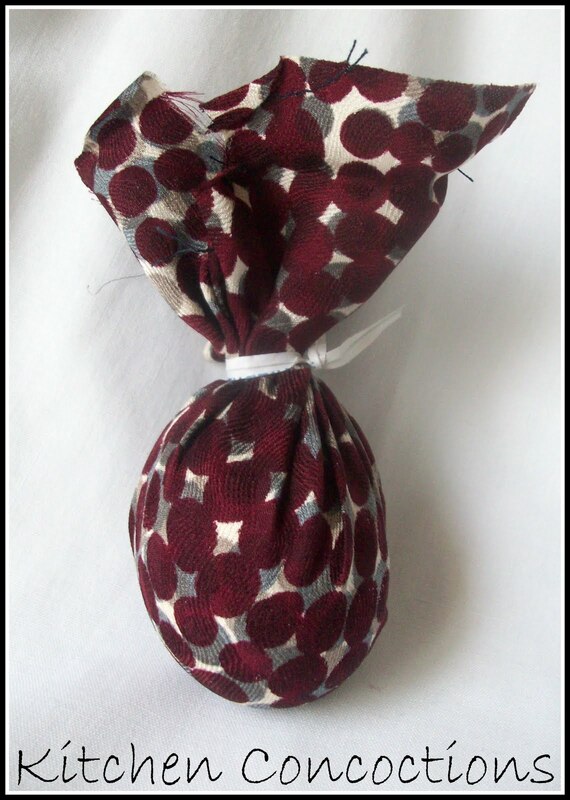 Secure silk fabric with twist-tie. 3. 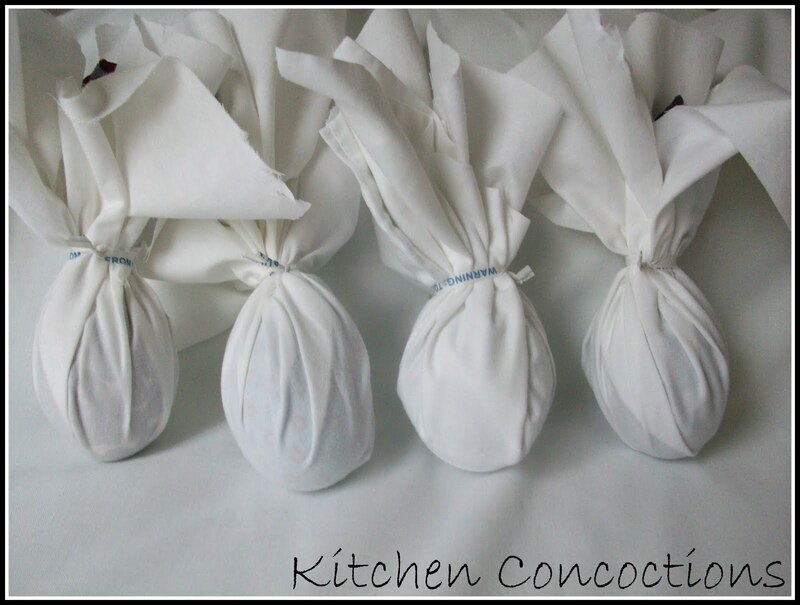 Place the silk-wrapped egg in a piece of white sheet and secure tightly with another twist-tie. 4. 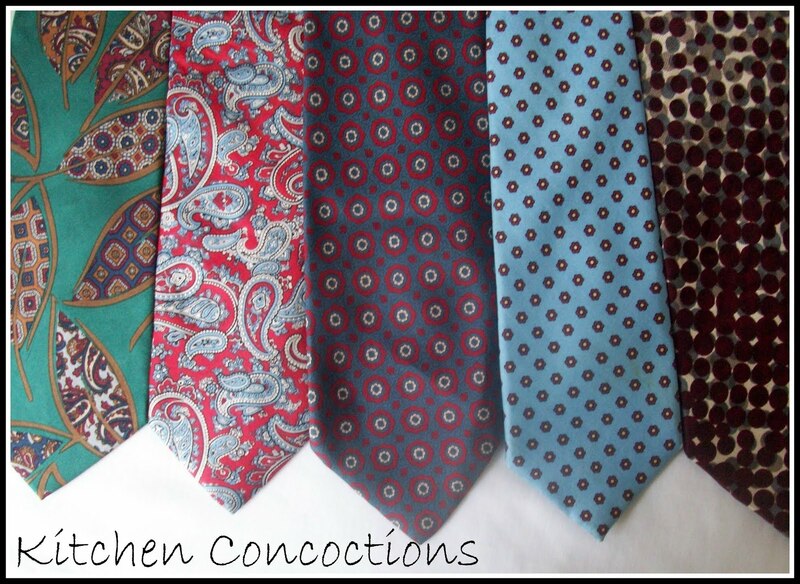 Repeat with additional silk ties and eggs. 5. Place the eggs in a pot. Fill pot with water to cover eggs completely. Then, add 1/4 cup of white vinegar. 6. Bring water to a boil and simmer for 20-25 minutes. 7. Remove eggs from water with tongs or spoon and let cool on a pile of paper towels or in a colander. 8. 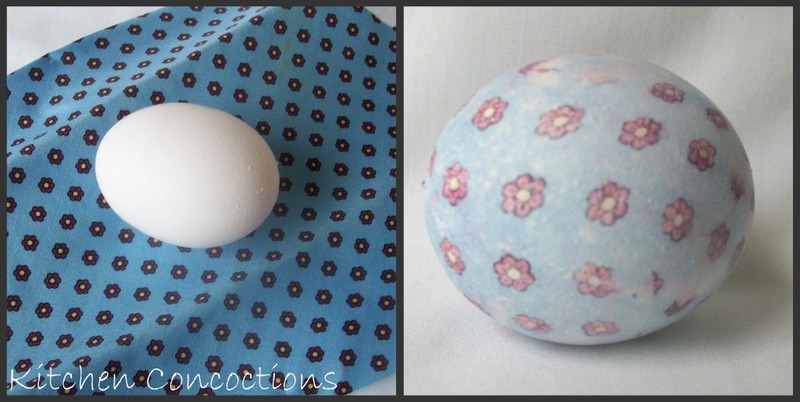 When eggs are cool enough to handle remove the fabric and enjoy your beautiful eggs! Note: Due to the fact that the dye in the ties are not food safe and edible (and if you get your ties at the thrift store, no telling where they came from) it is advised that you don’t eat these eggs. Just look at them and enjoy their coolness and beauty. Thats sweet! Makes me want to die eggs! I saw this somewhere last year and wanted to try it. You have reminded me again and maybe I will actually do it this year. What a great idea. 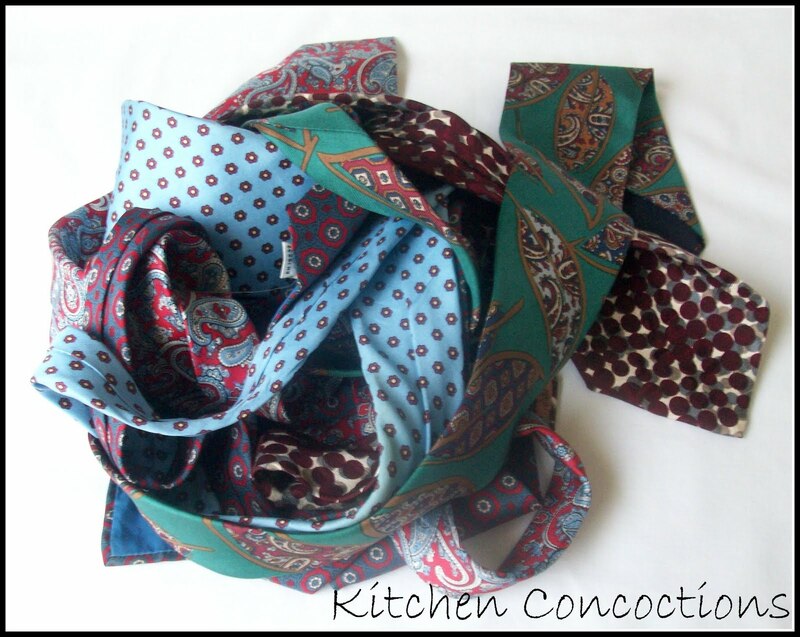 I need to convince the wife to condemn some old neckties for the cause! I think our daughter would love this. I just saw this over at OBB and I really want to try it now! !